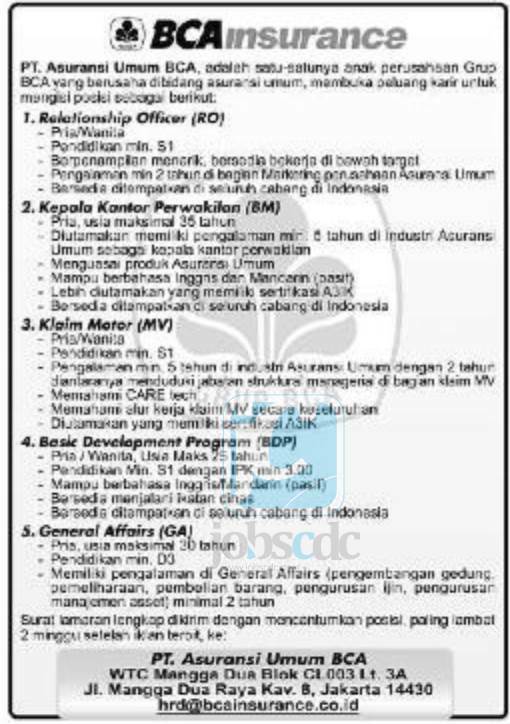 Lowongan Kerja PT Asuransi Umum BCA - BCA Insurance is rapidly growing general insurance company in Indonesia with majority share holder by PT Bank Central Asia Tbk (BCA Group). BCA Group - the largest privately-owned bank in Indonesia holds 75% shares in BCA Insurance with the remainder of the shares belonging to PT BCA Finance (25%). Originally registered as PT Asuransi Ganesha Cipta Danamas in 1988. In 2006, the Company transformed into PT Transpacific General Insurance. The name of PT Asuransi Umum BCA was launched in December 2013. 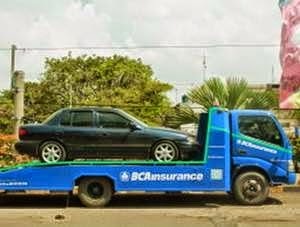 BCA Insurance is based in Jakarta and now operates 11 marketing/representative offices throughout Indonesia, located at Bandung, Semarang, Solo, Surabaya, Malang, Lampung, Palembang, Medan, Balikpapan, Denpasar, and Makassar. In term of financial performance, BCA Insurance has recorded a positive results in 2014. total asset in 2014 recorded as Rp 679.45 billion, 56.07% increased to previous year (Rp 435.33 billion). Total comprehensive profit continue to grow by 38.16% to Rp 36.16 billion from Rp 26.17 billion in 2013. Minimum 2 years of experience in the field of marketing at general insurance company. Good looking and willing to work under target. Male, with the maximum age of 35 years old. Preferably with minimum 5 years of experience as representative offices head at general insurance industry. Good knowledge of general insurance products. Fluent in English and Mandari (passive). Minimum 5 years of experience at general insurance industry with 2 years in managerial position in the field of MV Klaim. Good understanding about care tech. Good understanding about the overall workflow of MV claims. Male/Female with the maximum age of 25 years old. Minimum S1 with the minimum GPA of 3.00. Male, with the maximum age of 30 years old.